Yesterdays ultrasound revealed to us that SHE passed. Telling Jordan has sucked more than I could have imagined. She was so very excited to have a new sibling and hasn't had any exposure to death. I'm feeling pretty numb about a lot of things. I'm feeling pretty angry about a lot of things. I feel like she knew how much she was loved and wanted. I feel like I let all who loved her already down. I want, and hope, I can get some answers to why this happened. I love Vivian Eve, and I miss her already. what d'ya know - it's been about a month... again. I NEED TO GET BETTER ABOUT THIS! I open the page a few times to post, but get side tracked and then it's late and I'm tired and choose sleep. Sleep always wins. It always has and it always will. I LOVE SLEEP. Anyway, the girls are good. N still loves J. And Tangled & all things Tangled - absolutely adorable. Newb seems to be doing well- causing some random spotting, and I'm pretty sure reading all the notes that their sisters left scrawled across the walls of my ute telling future residents all the ways to make trouble while on the inside. my kids are that smart and can read & write as fetuses. that would explain why my 5'2" :sigh: 1.5", 1none-ya-business lb frame has such big babies - b/c they're reading and writing & mindlessly stealing my food eating. yeah... I'm paranoid. I'm sure that's it. I go on Monday for the NT scan and am really worried about it. I shouldn't be, but I am, so I'll relax after Monday (maybe). Jordan also goes back to get her eyes checked again on Monday. I'm going to talk to the dr about the surgery - we don't want to do the drops and she takes the patch off her glasses and we really think that it's the best option for her. I don't like that we feel like it's the best option, but (and I've learned this a lot and I still think it's the lamest part of being an adult/parent) as a parent, you don't get to always LIKE what's best as long as you're doing what is genuinely in your childs best interests. lame, I tell ya. lame. and that's about all I have to say right now, b/c I am tired. Norah is TROUBLE. Yes, it needed to be capitalized & bolded. She's sweet & fun & a ball of love, but the kid is trouble. Today, she was dancing with my ipod. Yes, my ipod took a dive, WHILE Jordan was peeing. The ipod seems to have survived it's quick dip, although I am leaving it in rice overnight just to play it safe, but my point it, Jordan is awesome. She stopped going to the bathroom to save my ipod. Now, I wish I could say it's b/c she knows I love it, but I don't, so I honestly think it's b/c she loves it and if it went away so would her kitchen dance parties (and bubble wrap app). Norah, being the explorer that she is, has been taking on the dining room table & chairs. We have a pub height set, so it is a climb when she gets up there - which she does amazingly quickly. After dinner she climbed up into Jordan's seat to finish J's juice box. J pushed her in to keep her 'safe & sound' and told me she was taking care of her so that she wouldn't get into trouble. Jordan also feeds the pets every night. It's her responsibility and she's pretty awesome at it and never forgets. told you my kids were pretty awesome. what d'ya know - it's been over a month, again. So it's been over a month, again, since I've written. I guess I just don't have much to share, I should, b/c my girls are awesome, but I just take it for granted that our day-to-day is usually pretty good. Norah is 6months post-op (yesterday) and doing great. Jordan is preparing to turn 18 and run away to culinary school (sheperoni pie & hot dogs are her current specialties). J & N play together all the time. They're nearly inseparable, but when they are apart, they always know what the other one is doing. It's a little eerie at times. Like, I can be cooking with J and say I wonder what N is up to & J will tell me exactly what she's doing (yes I check & J has always been spot on). I think N just has some super human type hearing b/c she hears J the second she wakes up & comes running to let me know. We bought a couch last week. The girls enjoyed climbing all over the showroom & running from display to display. The girls were busy, but well behaved & I was proud of them. I can't wait until the new couch gets here & they can't take to back cushions off to jump on. Oh, yeah, and I'm pregnant again. Due in October, so if this one decides to arrive that month, my kids birthdays will be October, November & December... talk about making the end of the year expensive! 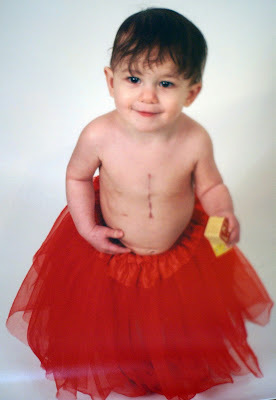 First things first, check out this amazing pinterest board - The Faces of CHD - Congenital Heart Awareness Week Feb 7-12, 2012 - it links to stories/blogs of CHD warriors & their families. Norah was born with heterotaxy, an ASD, VSD, interrupted IVC w/ azygos continuation and a touch of pulmonary stenosis, polysplenia (she has 2 functional spleens), an intestinal malrotation and some minor hydronephrosis. Norah has had 2 surgeries in her short life - the first, a Ladd's procedure, was when she was 5weeks old to correct her intestinal malrotation, and her second, the open heart surgery (1st post, 2nd post), was when she was 9.5months old to close her VSD. We were fortunate enough to know she'd have a CHD before birth. It was a tough to go through the pregnancy not knowing what would be wrong with her (bad news started when I was about 12w along), but always loving her. She was, and IS, perfect. It took a long time to remember that she was perfect (at least to me) before I knew about her conditions and that they didn't change anything. She was still the baby I loved, she'd just have a more colorful story than some. How to describe Norah... she's a ball of love, energy & chaos, always kissing or climbing or finding a way to get into something! There isn't a day that goes by that we don't find her in some strange spot (like the oven of the play kitchen) or acting like a complete wild child (like climbing through the bookshelf or hanging out on 'end table island'). She loves her family, especially her big sister and everything she does, and her pets. Norah hates when she's awake & Jordan is asleep - it's like a punishment I swear. She lights up the room with her smiles and makes you cringe with her screeches. It's go, go, GO from the moment she wakes up until the moment she falls asleep for the night. She's just a baby like any healthy baby. Ok, I guess she's a toddler now, she is 14 months old and running & climbing everything, I'm just not ready to admit it. this is the perfect photographic description of Norah - she does.not.stop. 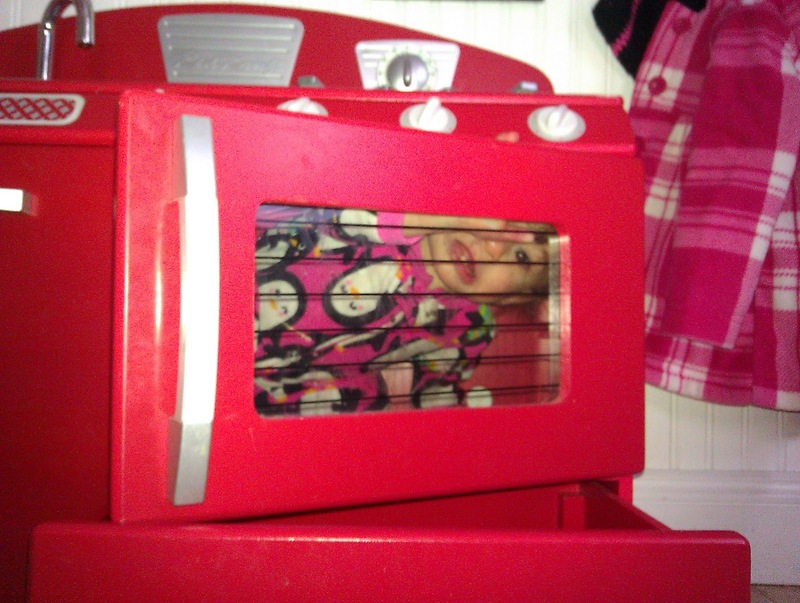 thought I was kidding about the play kitchen, weren't you? plague is back. back again. RUN! oh my. It's been a loooong week. Jordan started coming down with a cold on Sunday. She had a touch of a runny nose on Saturday, but Sunday, you knew the cold was imminent. On Monday, she sounded cruddy before lunch and after nap, she couldn't pass air. I brought her straight to the pedi for a few albuterol treatments and then, we took a rescue to the hospital. Sounds fun already, doesn't it? Jordan did great with the rescue & getting to the hospital & even sitting in the ER until around 1am. She was a rock star & I'm so proud of my girl for being so good. It really hit her in the morning that we were still at the hospital and she woke up begging to go home - broke.my.heart. We used her pulse ox lead as a leash whenever we went potty & she was a pretty well behaved puppy :) She let the doctors and nurses check her out (mostly) without a fight - hey, you can't blame the kid for getting a little fussy at 11pm when bedtime is typically 8 and she can't breath and yet another dr is telling her to take a deep breath. We watched rugrats on Nick's kindle, and waited and waited and waited to get the final word if she'd be spending the night & when she'd get to go to her room. side note: BIG THANKS to the hubs for getting out of work & coming up to the pedi and then coming down to the hospital to sit with us & BIG THANKS to my Mom for watching Norah while we sat with Jordan. One night was more than enough to spend at Hasbro - I still don't like that place. It was slightly better than the last stay, but I was irritated to be told that J has a history of asthma so many times. No, she doesn't. She had bronciolitis in March of 2011 and (as of then) wheezing and shortness of breath with a cold. They just pushed an asthma diagnosis on her, when in fact she has pneumonia, a double ear infection (I was told a couple times that her ears were clear, yet her pedi, before transfer, saw some fluid, as did I in the ER when I looked) and an enterovirus. Norah has a cold, too, and I'm very hopeful that it doesn't turn for her. She's been a champ with it and is still just as energetic as ever. Jordan was almost keeping up with her thanks to some help from prednisolone & albuterol! Sadly, the plague hit Nick overnight. He's miserable, but trying to make the best of it. So there's the update. I'm buying some stock in kleenex & charmin & Yellow Tail.